ПОНЕДЕЛЬНИК: INTERNATIONAL PARTY в Shishas Flame Bar! БЕЗЛИМИТНЫЙ КОКТЕЙЛЬНЫЙ БАР! Дорогие девушки, а у нас для Вас грандиозный сюрприз – БЕЗЛИМИТНЫЙ КОКТЕЙЛЬНЫЙ БАР! Что такое БЕЗЛИМИТНЫЙ БАР? Все просто – Вы приобретаете браслет за 495 р. и выпиваете ровно столько коктейлей, сколько сможете, а можете Вы многое – мы уверены в этом, да и останавливаться на достигнутом никогда не стоит! ;) Браслет дает возможность безгранично пользоваться услугами бармена в течение двух часов: с 23:00 до 01:00 или с 01:00 до 03:00. Также Вы можете приобрести VIP-браслет за 895 р. и тогда бармен становится Вашим на целых четыре часа – с 23:00 до 03:00. И поверьте, наши бармены могут сделать погорячее! Сильный пол также не будет обделен вниманием, ведь параллельно действует акция абсолютно для всех желающих: 4 коктейля по цене 1! Да, это действительно сумасшествие, ведь мы наливаем от души – целых четыре по цене одного! Стартуем каждый ПОНЕДЕЛЬНИК с 23:00 и до 6 утра! EVERY MONDAY: INTERNATIONAL PARTY in Shishas Flame Bar on Pushkinskaya! The best music from all around the world and the hottest atmosphere! UNLIMITED COCKTAIL BAR! EVERY MONDAY we are waiting everybody, regardless of nationality, gender and religion, for INTERNATIONAL PARTY in Shishas Flame Bar on Pushkinskaya - the dance floor and bar counter will unite everyone! We strengthen diplomatic relations and international friendship! And we drink for this! Dear ladies, we have a grandiose surprise for you - UNLIMITED COCKTAIL BAR! What is UNLIMITED COCKTAIL BAR? Everything's simple - you buy a bracelet for 495 rubles and drink exactly as many cocktails as you can, and we are sure you can do it a lot, besides it's never worth stopping at what has been achieved! ;) The bracelet allows you to use the services of the barman limitlessly for two hours: from 23:00 to 01:00 or from 01:00 to 03:00. You can also buy a VIP bracelet for 895 rubles and then the barman becomes yours for four hours - from 23:00 to 03:00. And trust our barmen – it will be really drunk and fun really fast! Men will also not be deprived of attention, because in the same time we have the special offer absolutely for everyone: 4 cocktails at a price of 1! Yes, this is really crazy, because we pour from the heart - four for the price of one! We start every MONDAY at 23:00 and party goes on until 6 in the morning! - Book a table for 8 people or more – get a bottle of sparkling wine as a GIFT! - Birthday? We present you a 20% discount on everything! - PIZZA - before midnight get 50% discount on ANY PIZZA YOU WANT! - Order a hookah on fresh fruit and get traditional hookah for FREE! - 12:00-16:00: 20% discount on the NON-ALCOHOLIC beverages and all food menu! - 22:00-23:00: 2XL cocktails = 1200 rubles! - 23:00-03:00: UNLIMITED COCKTAIL BAR for ladies! Happy hours offer includes more than 40 cocktails - from fast shots to huge long drinks and burning extreme cocktails! 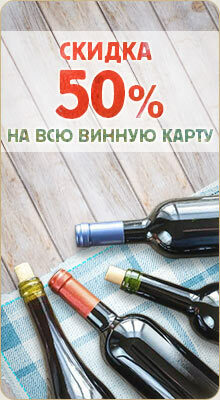 You will not find the same deal anywhere else in Moscow! Have fun with us 7 days a week until 6 am!